The Taoiseach said he inquired with Clare County Council about the planning permission after Trump raised concerns with him. Leo Varadkar speaking at the Capitol Hill lunch today. OPPOSITION PARTIES HAVE criticised An Taoiseach Leo Varadkar and asked him to clarify remark he made when he said that he intervened on behalf of US President Donald Trump in order to stop a wind farm being built near Trump’s Doonbeg golf course in Clare. One opposition politician has described it as ‘extraordinary’ that Varadkar would have made political representations to a county council on behalf of a businessman when he was a Minister. The leaders of Sinn Féin and Fianna Fáil have both sought clarification over exactly what Varadkar was referring to when he said he had intervened. 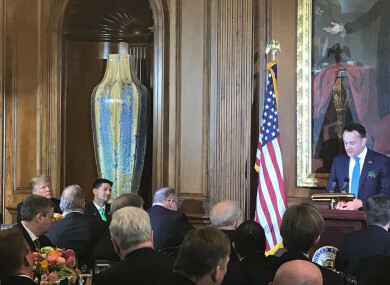 Varadkar spoke about what happened at a special luncheon at Capitol Hill in Washington DC today, following a meeting in the White House with Trump. Addressing the crowd, which included the US president, House Speaker Paul Ryan and Sinn Féin’s Mary Lou McDonald, Varadkar said Trump had reminded him today that their paths had crossed before. The Taoiseach said that ‘three or four years ago’, when he was Transport and Sports Minister, he received a call from Trump. “My assistant said ‘there is call from Donald Trump – he wants to speak to you’. I thought this can’t be the case, this must be a piss-take by one of my staff members,” Varadkar said. Varadkar said he assumed it was a joke as he thought a businessman like Donald Trump – who was not president at the time – would write a letter first to arrange a meeting. Recalling what happened, the Taoiseach said he spoke to Trump over the phone about his Doonbeg golf resort. “At the other end of the phone was Donald Trump saying to me he had bought this resort in Ireland in County Clare, this beautiful golf resort in Doonbeg, and there was problem as someone was trying to build a wind farm and that of course, it could have a real impact on tourism and the beauty of the landscape. “So I endeavoured to do what I could do about it. I rang [Clare] County Council and inquired about the planning permission and subsequently, the planning permission was declined, and the wind farm was never built, thus the landscape being preserved,” said Varadkar, with the room erupting in laughter. He said the president “has kindly given me credit for that, although I think it would probably have been refused anyway”. Varadkar had recounted the story in an interview with Time Magazine previously, but certain aspects of it were omitted. Much of the opposition did not see the funny side to the Taoiseach’s story. “It seems extraordinary, particularly when the Taoiseach was so involved in giving his opinion on not wanting to invite President Trump to Ireland this time last year when Enda Kenny was Taoiseach,” said Fianna Fáil housing spokesperson Barry Cowen in a statement. Fianna Fáil leader Micaheál Martin called on Varadkar to be “more transparent in relation to his intervention with Clare County Council on behalf of President Trump”. Sinn Féin leader Mary Lou McDonald said she was “taken aback and concerned” by the revelation and also asked for more clarity. Labour leader Brendan Howlin also expressed concern that the Taoiseach made political representations to Clare County Council on behalf of Trump’s private business interests. The reports from Washington today that Taoiseach Leo Varadkar has made political representations essentially on behalf of the business interests of President Trump are extraordinary. The Taoiseach needs to make clear immediately the nature of these representations and if President Trump or a member of his family asked the Taoiseach to make them on his behalf. Howlin said there are particular “sensitivities” around politicians making representations to planning authorities and for good reason, he added. “As Minister for Tourism, Leo Varadkar received a call from Donald Trump regarding a wind farm proposal near Doonbeg, which is a significant tourism asses on the west coast. “It’s normal for ministers to seek information on planning applications when issues are raised by citizens, businesses or investors. This matter has been mentioned publicly on very many occasions by the Taoiseach. I was not a court case of a judicial matter. Email “Opposition hit out at Taoiseach over phone call with Trump about Doonbeg wind farm four years ago”. Feedback on “Opposition hit out at Taoiseach over phone call with Trump about Doonbeg wind farm four years ago”.